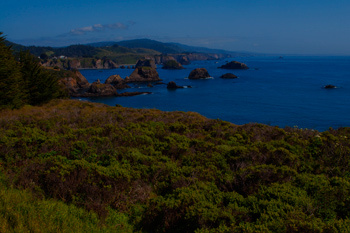 Redwoods, Rocks, Pacific Ocean, Mendocino Coast Near Elk And Point Arena, California, copyright 2012 by David Leland Hyde. Nikon D90. 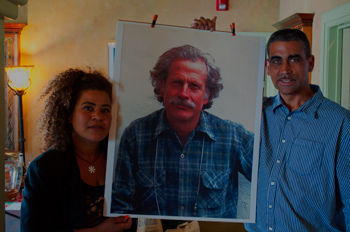 Robert Nicholas King, who passed on April 3, 2012 at age 79, helped protect the Watts Towers. To read more see the Los Angeles Times Article on how Nicholas King helped save the Watts Towers of Los Angeles and allowed the unusual sculpture to become world-renowned. 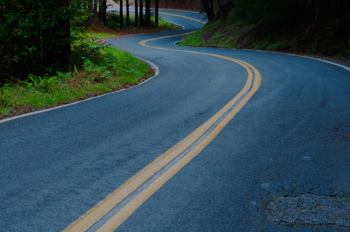 Eureka Hill Road, Redwoods, Garcia River Canyon, Near “The Land,” Point Arena, California, 2012 by David Leland Hyde. Nikon D90. Nicholas King was my mother’s middle brother out of three, all younger than her. His first name was Robert, but when he started working in Hollywood and off Broadway, because there was another actor named Robert King, he dropped his first name and went by his middle name Nicholas or Nick for the rest of his life. 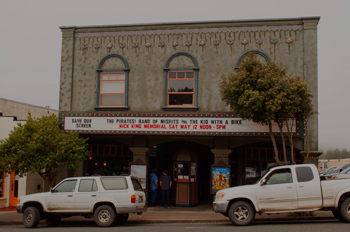 Point Arena Movie Theater With Marquee Showing Nicholas King Memorial, Point Arena, California, copyright 2012 David Leland Hyde. Nikon D90. 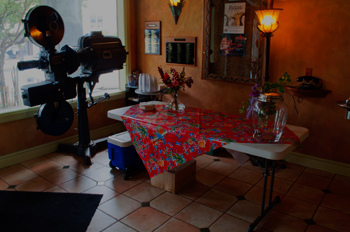 Film Projector, Lobby, Point Arena Movie Theater, Point Arena, California, copyright 2012 David Leland Hyde. Nikon D90. Wikipedia entry on Nicholas King. Sarah King Bjorg, Nicholas King (Photo) And Sam Rodia King, Lobby of Point Arena Theater, Point Arena, California, copyright 2012 David Leland Hyde. Nikon D90. 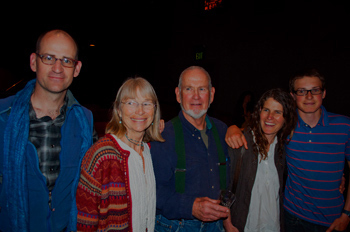 Ben King (Van King’s Son), Kate Todd (Nick’s First Wife), Van King (Nick’s Brother), Johanna King Hoite (Van’s Daughter) And Vigo Hoite (Johanna’s Oldest Son) At Nick King’s Memorial, Point Arena, California, copyright 2012 by David Leland Hyde. Nikon D90. by a subtle self-punishment that came up in unusual ways. In some respects he was one of the most optimistic people I have ever known, yet he also could get down on himself and circumstances and on some occasions felt that people were out to get him. 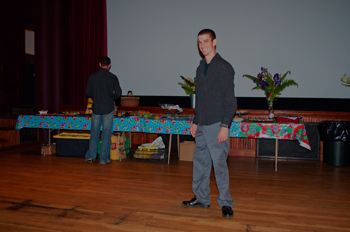 Potluck Spread, Silas King (Back Turned), Julian King (Nick’s Youngest Sons), Point Arena, California, copyright 2012 David Leland Hyde. Nikon D90. Nick’s Three Sons, Julian, Sam And Silas, Motion Blur, Point Arena, California, copyright 2012 David Leland Hyde. Nikon D90. local innovator, artist, lover, horticulturist, gardener, farmer and family man, who charmed his way through life and into the hearts of those he turned his good looks and joyful, wise and impish smile upon. 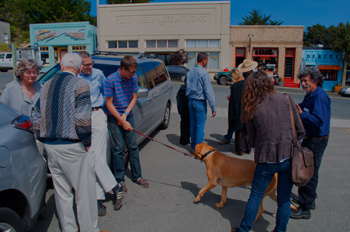 Charla & Clint King (Nick’s Brother) With Silas King, Point Arena, California, copyright 2012 David Leland Hyde. Nikon D90. 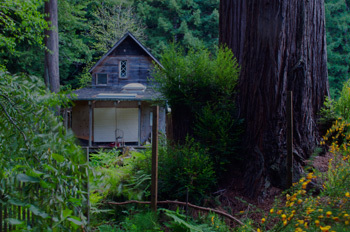 Nicholas King’s Home At The Land, Giant California Coast Redwoods, Point Arena, California, copyright 2012 David Leland Hyde. Nikon D90. 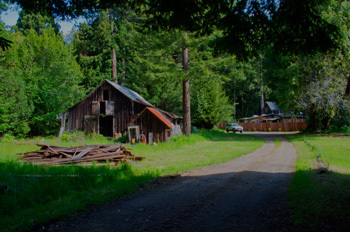 Old Barn, Nick’s House, Redwoods, The Land, Point Arena, California, copyright 2012 David Leland Hyde. Nikon D90. 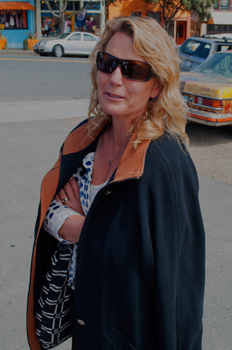 Johanna King Hoite, Point Arena, California, copyright 2012 David Leland Hyde. Nikon D90. 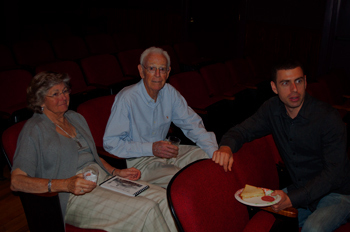 Van King, Johanna’s father, was there with his wife Linh, neither of whom have I seen much for the last 10 years. Van’s other daughter, his eldest, architect Caitlin King Lempres Brostrom had published a book this last year called, “The Houses of William Wurster: Frames for Living .” Just as Julian King, Nick’s youngest son, began to lead the cleanup inside the theater, the Point Arena based poet, teacher, classroom entertainer, author, visual artist, sculptor and wild dancer Blake More appeared on the scene in her hippie trippy poetry painted, moon, star and seashell festooned biodiesel mercedes. She wore her funkadelic outfit just for Nick. 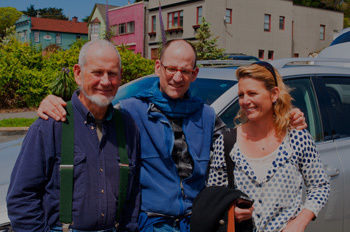 Simo Hoite (Johanna’s-Husband), Gwenn King Tanvas (Clint’s-Daughter), Sam King, Point Arena, California, copyright 2012 David Leland Hyde. Nikon D90. 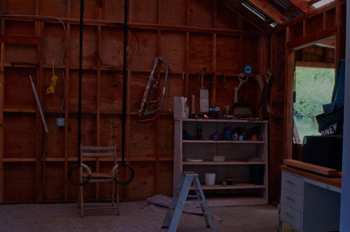 Nick’s Tool Shed, Garcia River Nursery, The Land, Point Arena, California, copyright 2012 David Leland Hyde. Nikon D90. probably over 200 people, had trees from Nicholas King at the Garcia River Nursery. 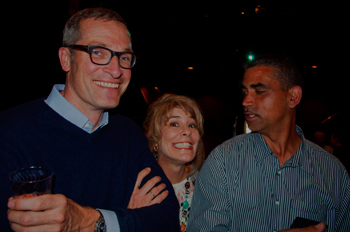 I had planned to talk, but they wrapped up the sharing portion before I stood up. 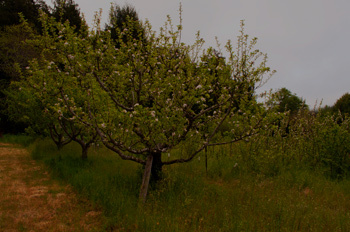 Apple Trees, Garcia River Nursery, The Land, Point Arena, California, copyright 2012 David Leland Hyde. Nikon D90. 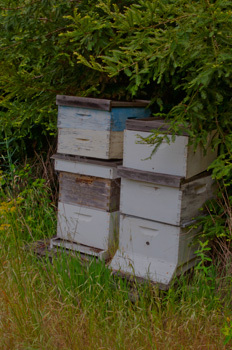 Nick’s Beehives, The Land, Point Arena, California, copyright 2012 David Leland Hyde. Nikon D90. I remember visiting The Land as a boy, swimming in the Garcia River at the swimming hole, running half naked through the fields and riding with Uncle Nick on his bulldozer. I remember watching him mill Redwood logs with his portable mill, splitting Redwood rounds for firewood, smelling the muddy earth smell of the heavy chunks of freshly split Redwood. We fished for Steelhead in the Garcia River too. I remember helping him work in his apple tree nursery. He used to give me a mild, easy-going lecture on grafting fruit trees, or varieties of apple stock, or apple blossoms, or other diverse farming or gardening subjects. In later years I would visit in my van. I brought food and wine and we drank and told stories at night. Uncle Nick and I took long walks on The Land in the mornings, walking along the Garcia River. We sat in the sauna by the Garcia River in the afternoons like old Indians. 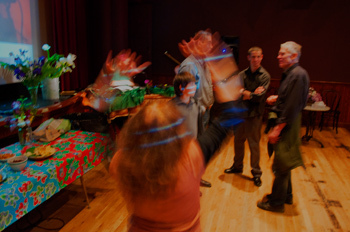 Dancing In The Projector Light, In Background: Sam King, Julian King and Hugh Todd (Kate’s Second Husband), copyright 2012 David Leland Hyde. Nikon D90. Local Poet, Blake More, Point Arena, California, copyright 2012 David Leland Hyde. Nikon D90. low rock walls and shapes of stones that marked the burial ground. That particular hike to the burial ground, neither of us ever forgot. Somehow between the rain, the drenched red earth, huddling under the trees being surrounded by flashes of lightening and the mysterious sacred ground before us, we bonded like I never have with any other human being before or since, except perhaps my father and mother and a girlfriend here or there. 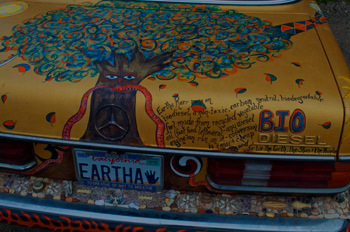 Blake More’s Biodiesel Mercedes, Point Arena, California, copyright 2012 David Leland Hyde. Nikon D90. Van King, Ben King, Caitlin King Lempres Brostrom (Van’s Oldest Daughter), Point Arena, California, copyright 2012 David Leland Hyde. Nikon D90. especially among us cousins. We sat at a separate table from the adults, which was both the wisest and the dumbest arrangement possible. I remember one Thanksgiving dinner where we cousins had a contest at the kid’s table at my Grandmother’s house, to see who could make the wildest, messiest, mashed-potatoes-squeezed-between-teeth face. Nick’s daughter Sarah won. 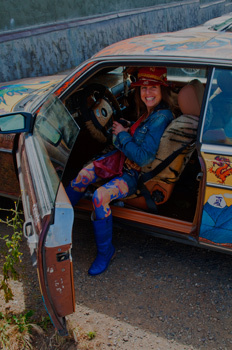 Caitlin King Lempres Brostrom, Author Of “The Houses of William Wurster: Frames For Living,” Point Arena, California, copyright 2012, David Leland Hyde. Nikon D90. rebellious way, but more often in a hip, fun way. He had a way of making anything interesting. His photography of people showed a deep sense of understanding. He also made some excellent historical documentary black and white photographs of Point Arena being nearly wiped out by a huge storm in the winter of 1983. A few of his friends and family brought together these images in a self-published book called, “The Great Disaster at Arena Cove .” Nicholas King’s legacy as an environmental activist in groups such as Friends of the Garcia River and Save Our Wild Salmon, as a farmer’s market seller, a community member and artistic thinker, lives on in his children and his nieces and nephews, all the next generation and their children too, in Point Arena and everywhere people knew him. 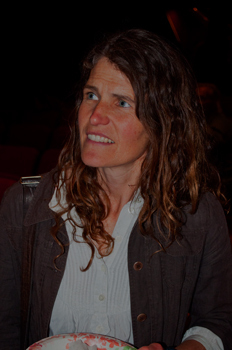 Kim King (Ben King’s Wife) Watching Johanna’s, Caitlin’s And Her Own Children, The Next Generation, Point Arena, California, copyright 2012 David Leland Hyde. Nikon D90. the dew and smell the sun on the apple blossoms, to drink in the cool morning air as it blew gently over the quiet meadows of The Land that was Nick’s home. Do you have an uncle or other relative with whom you have a special connection? 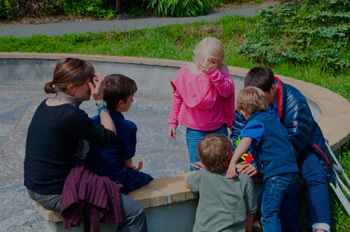 Charla, Clint, Simo, Vigo, Sam, Caitlin, Johanna And Others, Point Arena, California, copyright 2012 David Leland Hyde. Nikon D90. 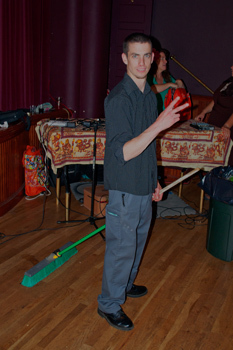 Julian King Throwing A Peace Sign, Point Arena, California, copyright 2012 David Leland Hyde. Nikon D90. 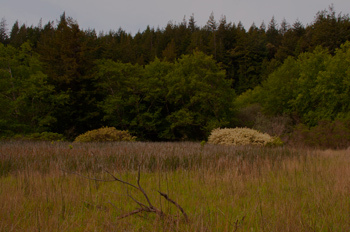 Fields On The Land Near the Garcia River, Point Arena, California, copyright 2012 David Leland Hyde. Nikon D90. 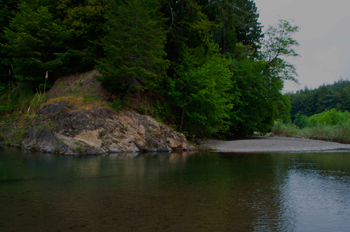 Swimming Hole, Garcia River, Point Arena, California, copyright 2012 David Leland Hyde. Nikon D90. 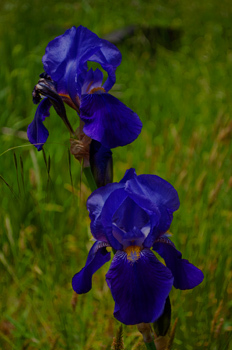 Irises, Nick’s Garden, The Land, Point Arena, California, copyright 2012 David Leland Hyde. Nikon D90. 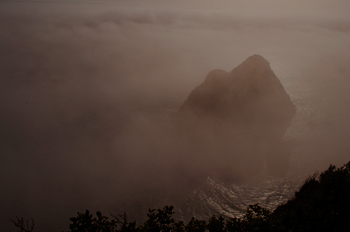 Fog, Mist, Rocky Promontory, Pacific Ocean, Mendocino Coast, California, copyright 2012 David Leland Hyde. Nikon D90. Very nice tribute to your uncle, David. Sounds like he was an interesting character. You were fortunate to have influences like that in your life. Hi PJ, thank you for your comment. It is wise of you to learn from and be “influenced” by your kids. My condolences for the loss, David. Sounds like your family put on a great memorial for your uncle. I appreciate that Richard. Thanks for reading. Hey there Cuz Gwenn, thank you for stopping by. I WAS listening: more articles from the heart, you said, and good advice that is too. Doing this post I thought might also be a great way to get my relatives interested in my blog. Our Uncle Nick was a great influence. How lucky are we? I am grateful to have had an uncle like him. hello! my regards to you all – soad from libya . David, this is a really lovely memorial to your uncle. He sounds like a great guy; may he rest in peace. 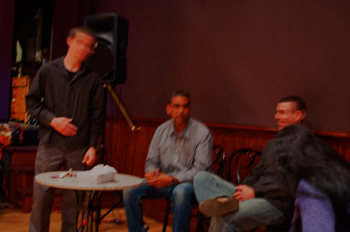 Hi Peter, Soad and Greg, Thank you each for your comments and for reading this blog post. David, I am very sorry for your loss of your uncle. I very much enjoyed reading this tribute. It is a nice remembrance , and I enjoyed the photos along the way as well. My mother has an old friend that used to run a boutique shop in Point Arena. I am not sure if she does anymore. I only visited there once in a quick pass through. You are fortunate to have had such a connection. Much of my family is very separated. Hi Mark, thank you for your kind words and support. It’s strange how far apart we all end up in this country sometimes. Dear Uncle Van, it means a lot to me that you read my blog post and made such a comment. I appreciate that you feel my parents would have liked it too. Glad you will return. There’s a lot more here that I feel you might enjoy. Blessings. very nice memorial for a very special man. I met Nick in May of 1967 when he hired me to rebuild the sound department at Studio 16 in San Francisco. In the next two years, we had developed quite a functional relationship and moved on to start Circle Productions with a focus on educational AV materials. By 1972 he was pretty much fed up with the big corporations we had to deal with (who can blame him?) and left full time for Point Arena. We lost touch after that (I stuck it out here in SF, which turned out ok after all), but this spring I felt a need to look him up, but it was very soon after his passing. I am so happy to hear that over the years he passed his wisdom, joys and spirit to so many others, youself included. It is amazing how much difference one person can make on this planet sometimes. Kind regards, John Cavala. Hi John, thank you for your comment. Great to hear from another friend of my uncle Nick. I’m glad you shared here a bit of what he meant to you. David, what a gorgeous tribute to a man so deeply imprinted upon all of us, indelibly. A true troubadour and lover of all things creative. I missed your words & pictures the first time around, so very glad to experience it now. Thank you. Hi Blake, I appreciate your thoughts, admiration and connection to my uncle. Very glad you came by here to express and to mention creativity, through which he most definitely inspired many. If it weren’t for him, you and I never would have met. I am blessed to meet another troubadour like you who also carries that fire and the life-affirming spirit of our forefathers and mothers.